The Coral Gables Music Club is pleased to announce that Max Holm has been chosen to receive a scholarship for your fine musicianship. The Scholarship Endowment Fund of the Coral Gables Music Club has been provided by generous benefactors, through fund raising events, donations, bequests and legacies. WOW! Thank you so much Mrs. Carolyn Davenport and Mrs. Patricia Clarke, who “discovered” me at the WDNA Jazz Radio Jazz Encounters in August! 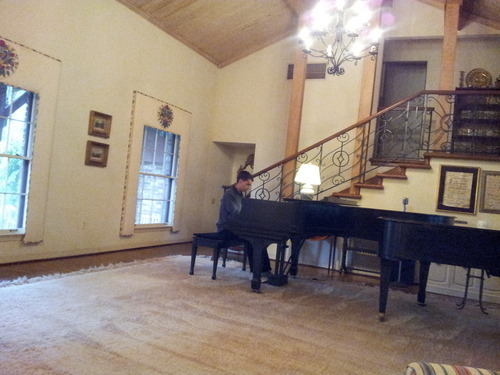 Here’s a pic of me playing a 100+ year old piano at Mrs. Davenport’s house. 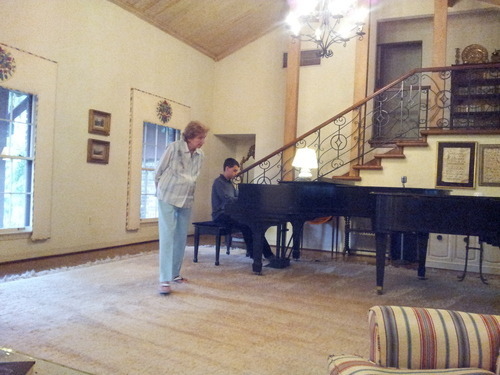 She’s a long-time jazz lover, who knows many famous jazz musicians. Music classes are expensive and this won’t cover everything, but it helps a lot. My dad stopped paying for music classes and sending child support a while ago.